In smaller deployments Microsoft Security Essentials (MSE) is a good, free alternative for anti-malware. If you decide to use MSE in your images, you will discover that sysprep resets the Out Of Box Experience (OOBE) settings for MSE. In other words; every user that logs on to a machine deployed from your image will see the MSE OOBE Wizard (Figure 1-2), until someone with Administrator privileges completes the wizard. Sometimes you might not want to expose your users to that. Fortunately for us, we can use Group Policy Preferences to bypass the OOBE wizard. Create a new Group Policy Object (GPO) or use an existing one. Create a new Registry preference for computers (Figure 3). 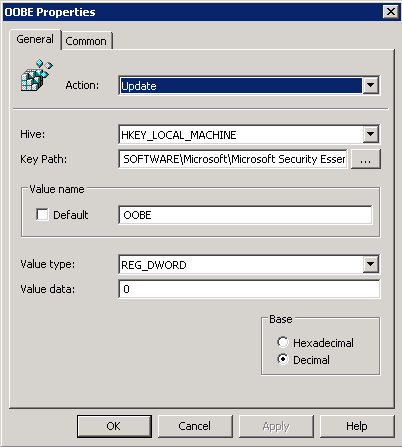 Update the key HKLM\SOFTWARE\Microsoft\Microsoft Security Essentials\OOBE DWORD to 0. Update policy on the client. Home Use. If you are a home user, then you may install and use any number of copies of the software on your personal devices for use by people who reside in your household. As a home user, you may not use the software in any commercial, non-profit, or revenue generating business activities. Small Business. If you operate a small business, then you may install and use the software on up to ten (10) devices in your business. The software may not be used on a device running an enterprise version of a Microsoft Windows operating system. The software may not be used on devices owned by government or academic institutions. Separation of Components. The components of the software are licensed as a single unit. You may not separate the components and install them on different devices. Included Microsoft Programs. The software may contain other Microsoft programs. 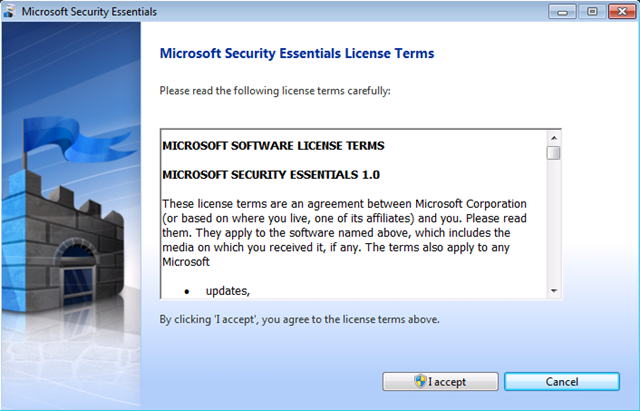 The license terms with those programs apply to your use of them.